I’ve played a lot of difficult platformers throughout the years, and some have been my favorite games to come back to play. 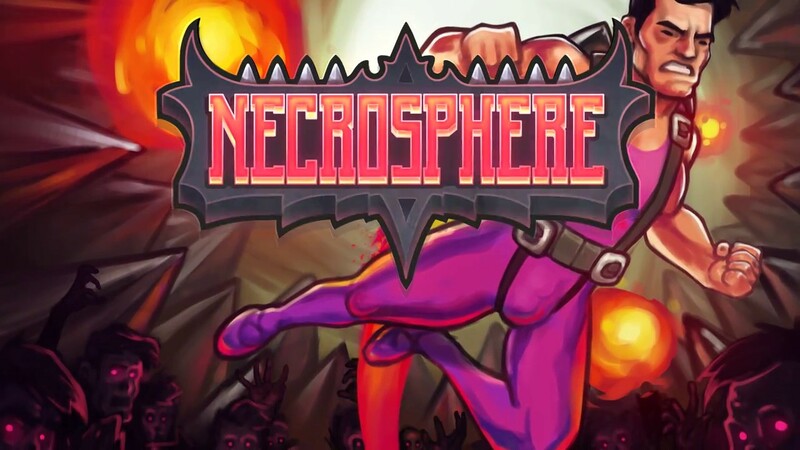 While going through Necrosphere Deluxe, I initially thought this would be one of those games, with its charming 8-bit graphics and metroidvania-style world. Despite all of that, this title is held back by a two-button control scheme, which adds unnecessary challenge to this otherwise unique game. Necrosphere has a relatively simple premise – Terry Cooper is mortally wounded during an altercation and is now trapped in the Necrosphere. At this point, you are trying to escape this realm and return to the world of the living. I found that this plot was set up well through this one cutscene, and the rest of the plot is added through letters sent to the protagonist by his cohorts. I personally found this to be a nice way to present the game, because it allows the player to choose how much they want to invest in the story. 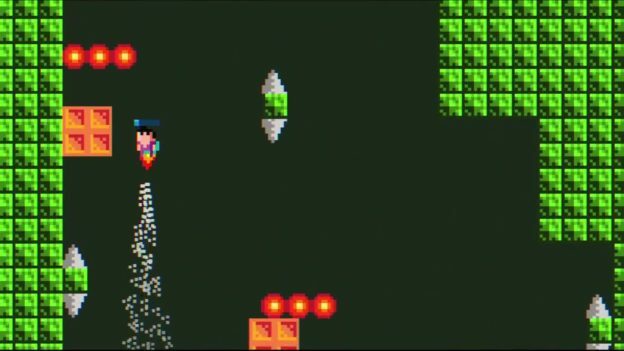 Graphically, this game has a very simple style that looks like an old-school 8-bit NES game, and it works well. I thoroughly enjoyed how the Necrosphere looked, each region with its own unique feel, such as the yellow area filled with flapping mouths or the opening section’s dilapidated temple with secret tunnels scattered throughout. All of these elements combined gave me the feeling that I was indeed in the middle of an underworld. 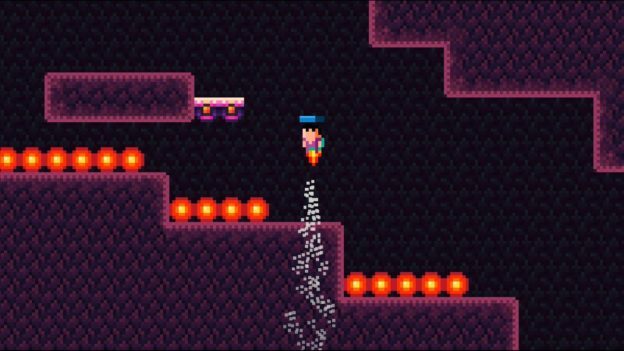 This game plays like a metroidvania, in the sense that you will be collecting items and then backtracking to different regions in order to solve new puzzles using these items. These items ranged from a ballet leotard that helps you jump, to a jetpack that lets Terry get to higher places. All of these items are used to solve different puzzles like avoiding murderous zombies or flipping a switch to get through a timed door. Along with these puzzles and power ups, there are twenty DVDs scattered throughout the Necroscape that unlock new bonus levels, which are even more challenging than the main game. My favorite thing about the world though is that there are torches that light up as you explore, which let you know that you have explored this area. While this is one little detail that may seem insignificant, I always have a tendency to get lost in the metroidvania genre; having these markers saved me a lot of hassle trying to figure out the path to my next objective. While there’s a lot to enjoy about the Necroscape, the controls are rough in sections. Player movement in the majority of 2D platformers is usually bound to the D-pad, but in Necroscape, you have a choice to either use the left directional button and the A button or the ZL and ZR buttons. While this control scheme seems interesting at first, the flaws start to show once you are required to jump and fly through the world. In order to jump you have to press the left or right button twice, and to fly you will have to press both buttons down at the same time. My worst experience with the controls was performing a puzzle where I had to flip nine switches in a certain order to open a door, which required precision flying and leaping in order to get to the switches. I found it hard to do, since I was required to tap the same two buttons in quick succession without accidentally tapping the other switches. While I felt challenged by these controls, it wasn’t in a way that made me feel like I was getting better at the game, but rather in a frustrating way, because I was having to redo otherwise simple puzzles and platforming sections. Necroscape Deluxe, while a pretty game with some great ideas, was a less than positive experience.. I think I would have loved this game if I could have been given just one more button for jumping. As it is, the puzzles were hindered by the hard-to-handle control scheme. I can’t really recommend this game, unless you’re looking for a nostalgic-feeling game that is a bit quirky.